Bergeval is a modern commercial "bi-coloured" apricot, developed from the well-known Bergeron (the variety you will most often see in French markets). It has an excellent orange-red colour, and a rich sweet orange flesh. You should find the fruit to be much juicier when home-grown than shop-bought. 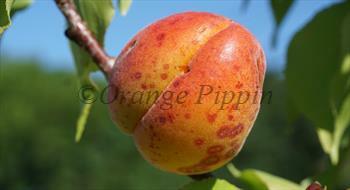 Bergeval is an early-season apricot, ripening in July in southern UK conditions. Bergeval® is a protected variety. Please fill in the details below and we will let you know when Bergeval apricot trees are back in stock. Bergeval is in flowering group 3. Bergeval is self-fertile and does not need a pollination partner, although fruiting may be improved if there is a compatible tree of a different variety nearby. Since it flowers in the middle of the blossom season it can be pollinated by most other apricot trees. Like all apricots Bergeval needs warmth, shelter, and should be planted in full sun. If you can provide this situation you should have a reasonable chance of success. In any other situation it is not worth trying. Perhaps surprisingly, Bergeval is very cold-hardy. In the UK winter cold is unlikely to be a problem, and the greatest danger is winters that are too warm (particularly in December / January). Apricots can take a few years to start producing, but as you might expect from a commercial variety, Bergeval is fairly precocious and you may get some apricots within 2 years of planting. Bergeval is considered a regular cropper in its natural home - commercial orchards in the Rhone valley of France. In the UK production will be variable depending on the weather. You do not need a pollinator as Bergeval is self-fertile, but planting another apricot of a different variety nearby will help fruit set. It flowers relatively late in the apricot blossom season, which is often helpful in UK conditions. Bergeval was developed by the French fruit research station, Inra (Institut national de la recherce agonomique). It is essentially an improvement on the traditional French Bergeron variety, and was intended to fill a gap in the market for an earlier-ripening apricot. The first trees were planted in 2006 in orchards in the Rhone valley, an area with an ideal climate for apricots.